Hi guys! 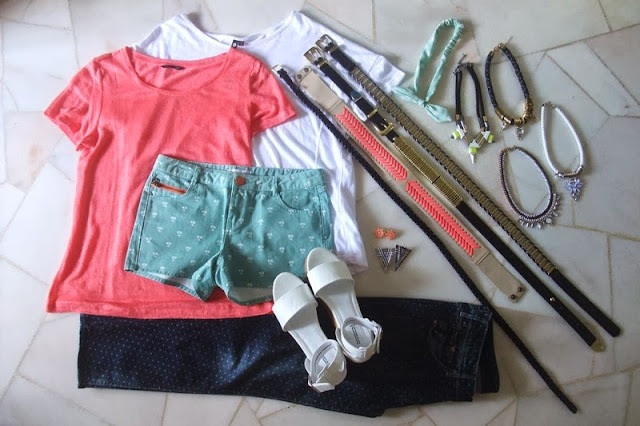 I'm a few days late but here is the long awaited October's monthly fashion haul. 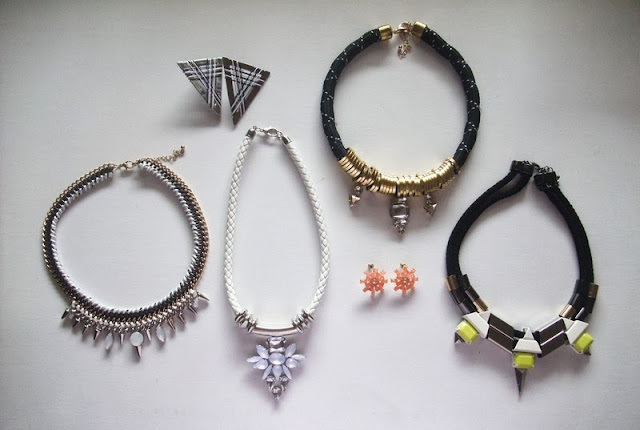 I got a ton of accessories this month, mainly from Topshop, they were having amazing designs on bogo this month so I went on a slight frenzy. This post is going to be pretty picture heavy so let's get right into it, shall we? 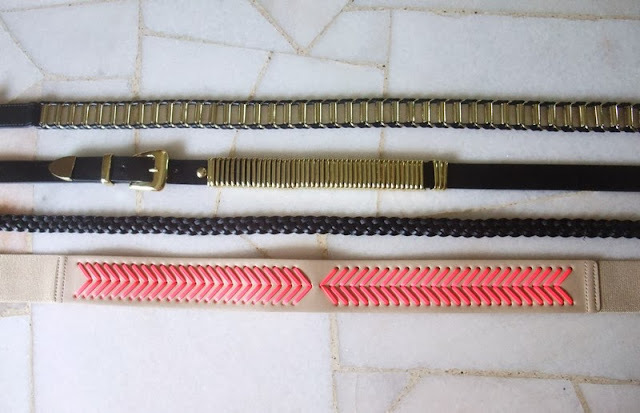 I'll start with accessories first. 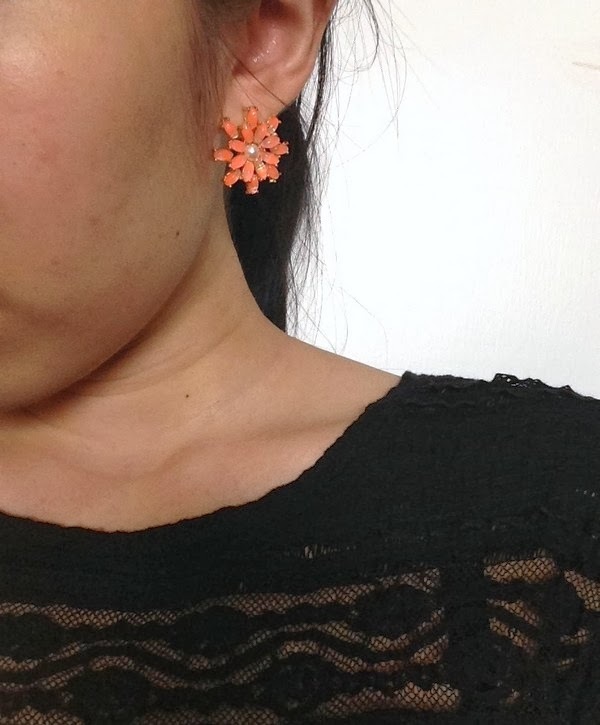 I got this very cute pair of earrings from Topshop. 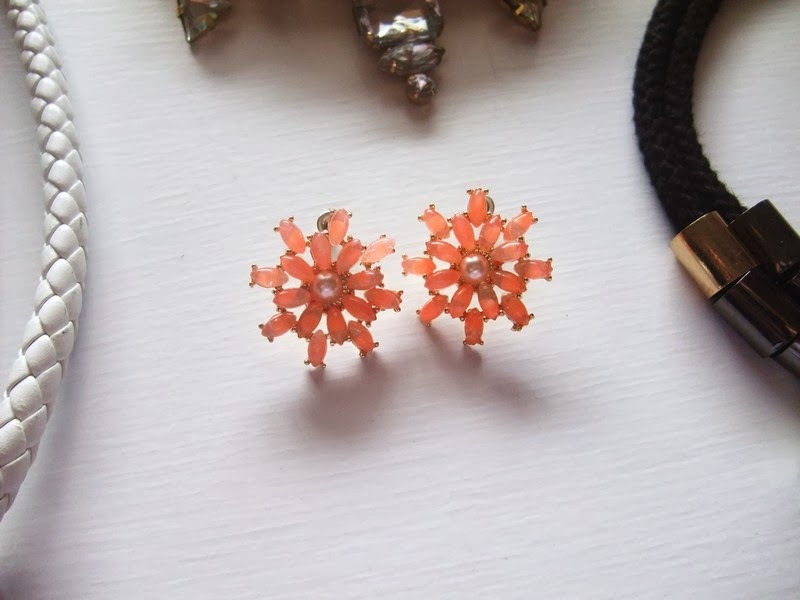 It was on sale for S$9 and has a very cute floral design made up orange gemstones with a faux pearl in the center. Original price was around S$19. 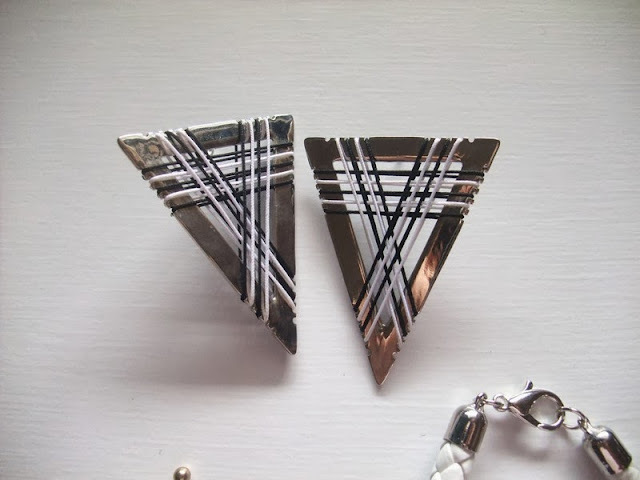 I got this mainly because it felt very designer inspired to me, like something you would find from Burberry. 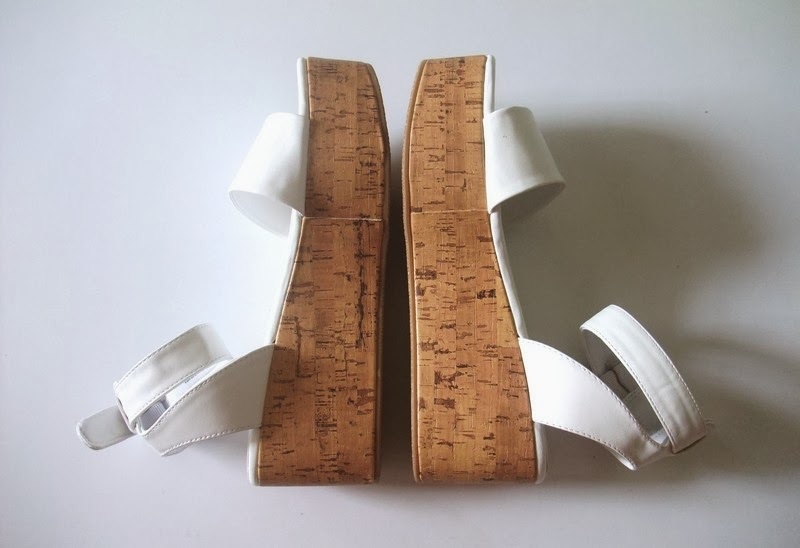 It has a very classy, elegant , upper class feel to it so I would definitely wear this to more formal, glamorous occasions. Also on sale for S$9, original price was around S$23. 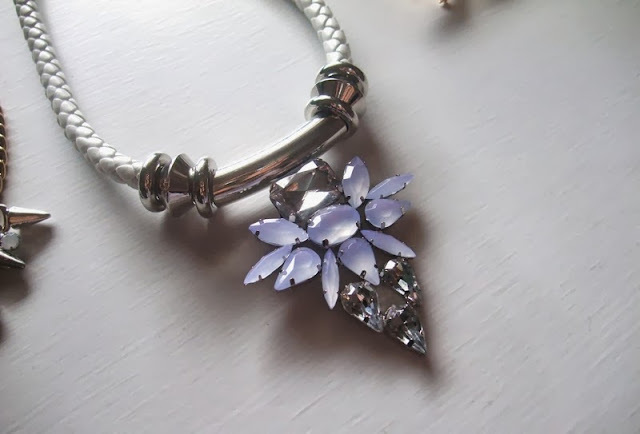 This necklace is definitely one of my favourite out of the bunch, it has a white leather weave band with a gorgeous pendant made up of a mixture of lilac/pale blue rhinestones with clear ones. 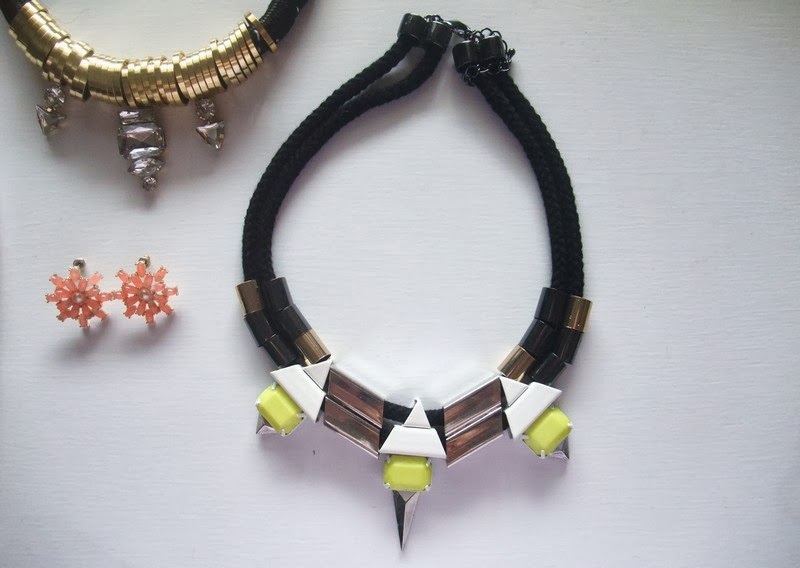 I think this is the perfect necklace for matching brighter outfits. On sale for S$19, original price was S$33. I really didn't expect to fall in love with this necklace when I first saw it. 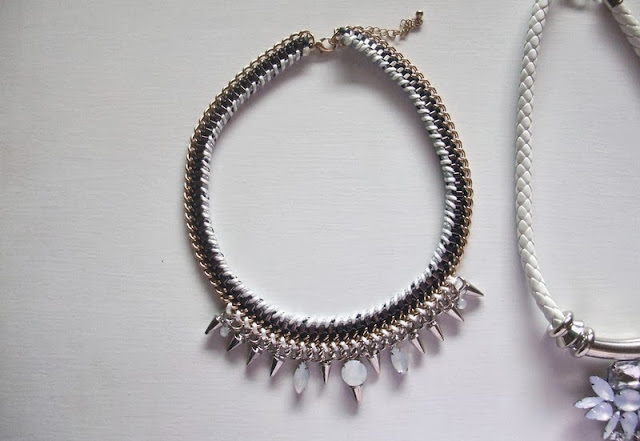 I don't really go for tube necklaces because they can weigh down an outfit and make the look too busy. 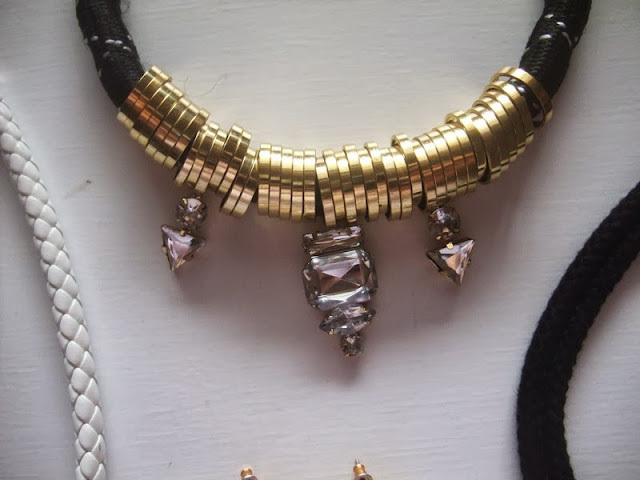 But I find myself reaching out for this necklace so many times. 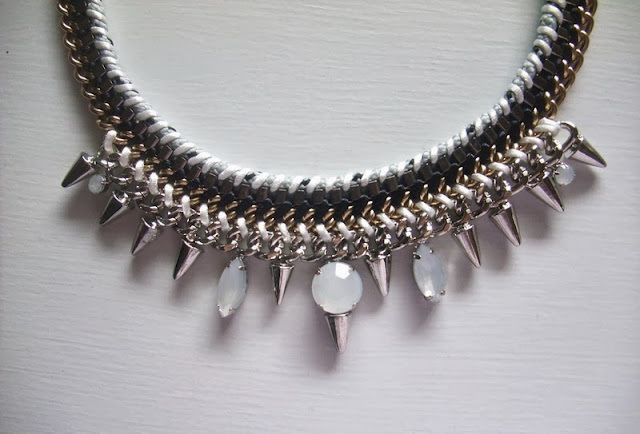 It matches almost anything I wear since my style is very casual, plain tee with jeans, and this necklace makes it more interesting. Original price was around S$33 - $36 and I got it on sale for S$19. This is hands down my favourite necklace purchase. This collar necklace has amazing details, and looks so well made and expensive. It has translucent white rhinestones of different sizes with silver spikes. I can't wait to wear it out. It was on sale for S19, usual price was S$36. Last piece and probably my least favourite out of the bunch. Don't get me wrong, I still love it. 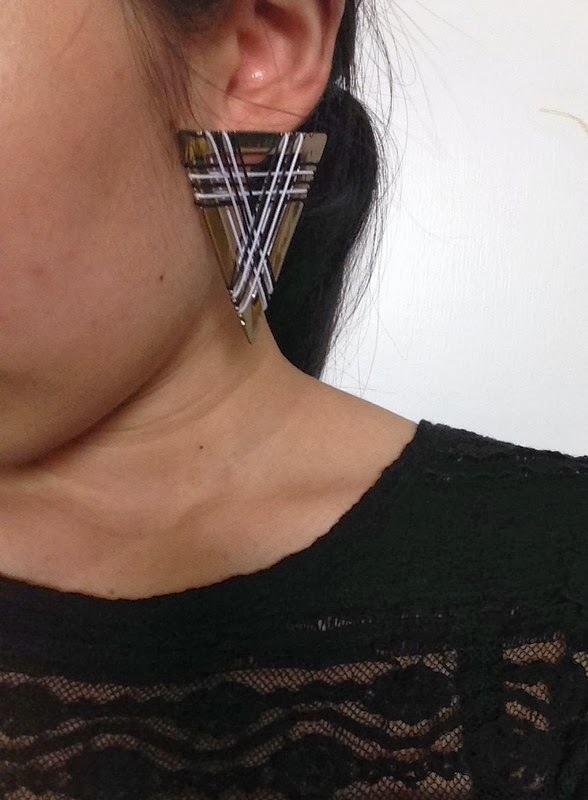 It has a very tribal, ethnic feel to it. It 'clangs' a lot which can be a nuisance at times. 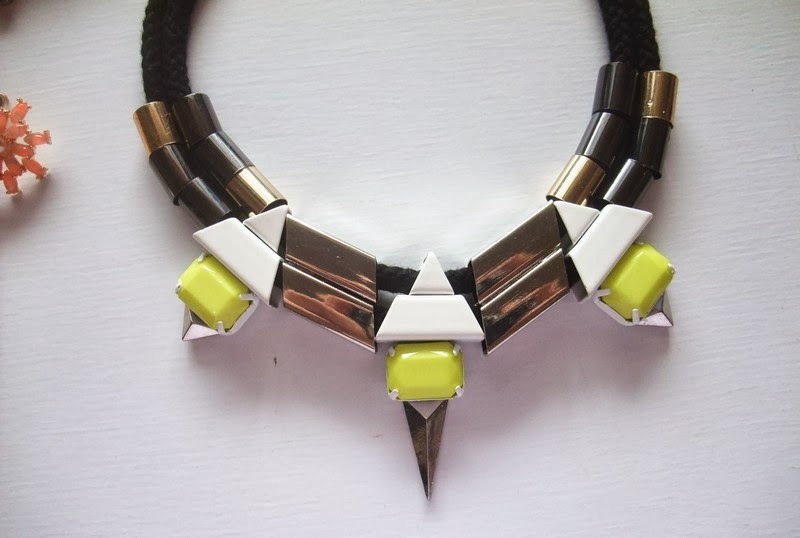 The design and colour spectrum of this necklace is amazing, it has black, gold, silver, white and neon yellow! So it goes with so many different colours and outfits. Originally S$33, on sale for S$19 as well. 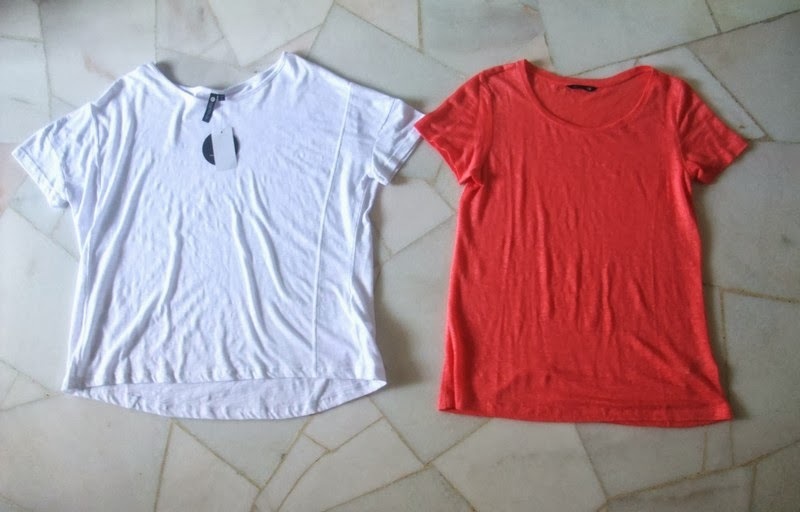 I got 2 basic tops from Cotton On (left) for S$5 and a coral tee from H&M (right) for S$7. Both tops are super comfy and cute. 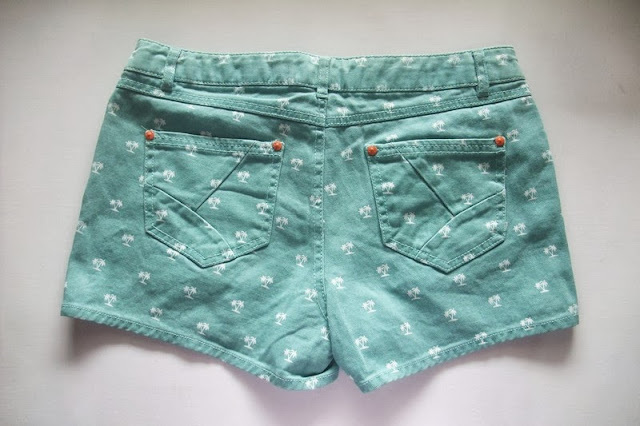 From Cache Cache, I got this pair of adorable palm tree printed mint shorts. 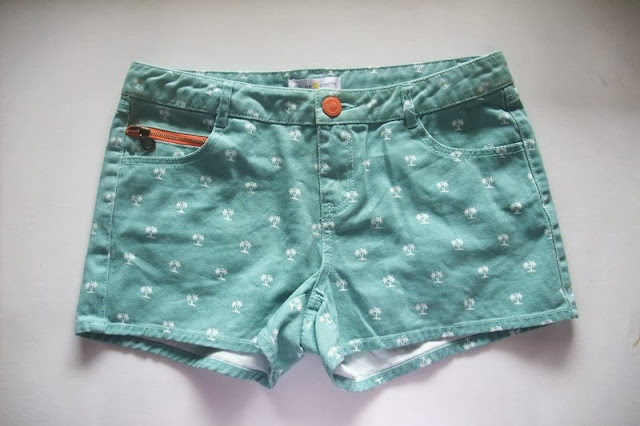 Although it is the fall season now, Singapore is still battling with the unpredictable heat and stormy weathers so shorts are definitely a staple for us. 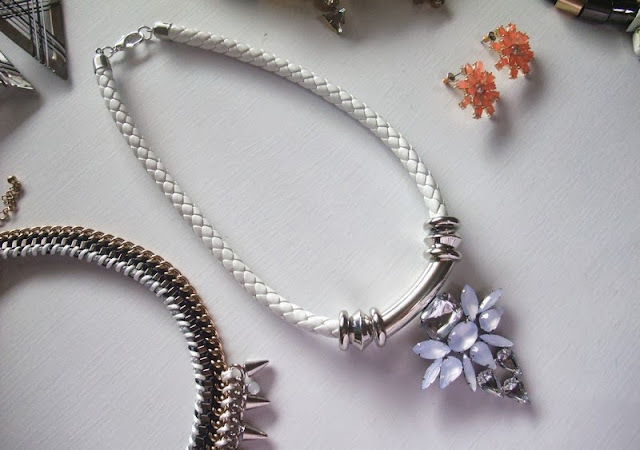 Originally $40 but had a 50% off. 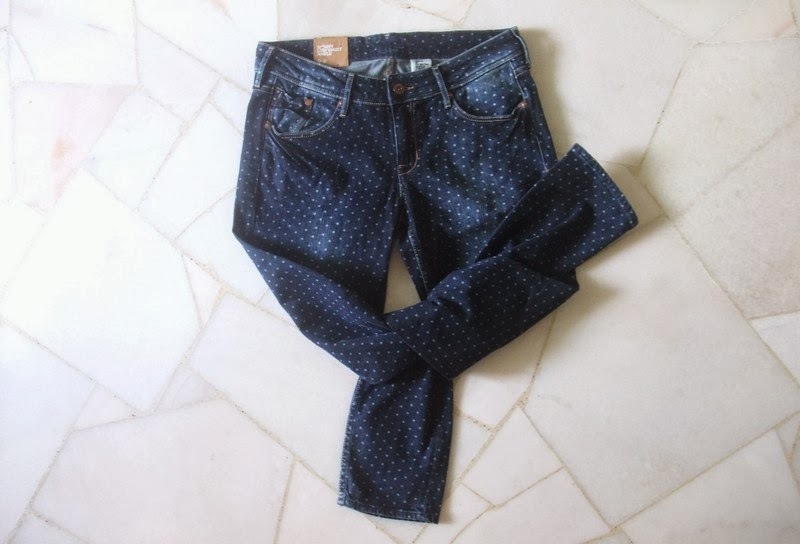 From H&M sale section, I purchased a pair of low waisted polka dot jeans. It fits really nice, doesn't make my legs look any bulkier than it is. 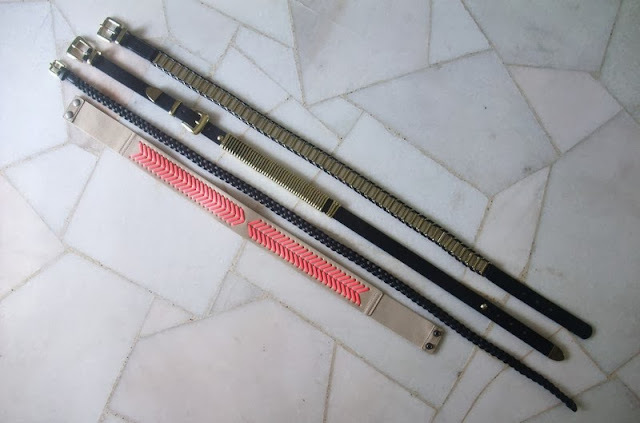 It was on sale for S$30, originally around S$60-$70. I went a little crazy in H&M belt section. They were all on sale for less than S$10 and I was really surprise because there were some really heavy pieces. 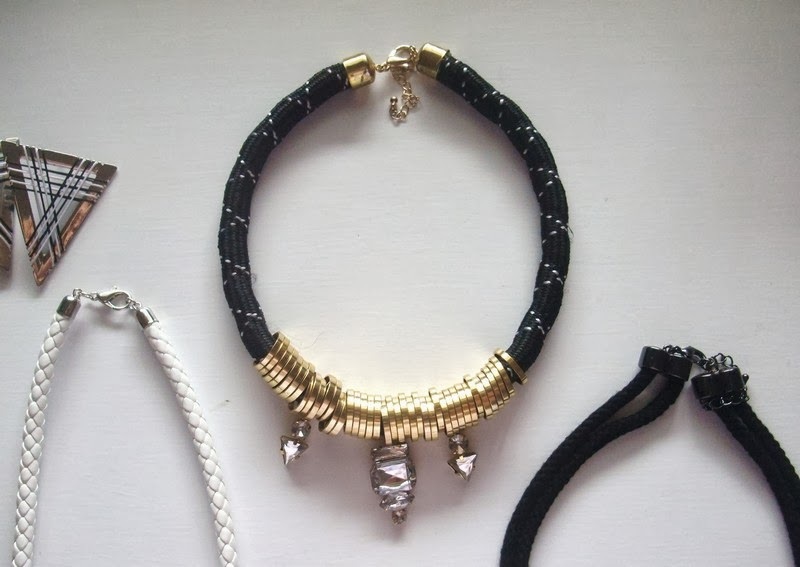 From top to bottom: S$10, S$5, S$3, S$3. I believe some are still available in stores. From Topshop, I got a cute mint polka dot headband for S$9. 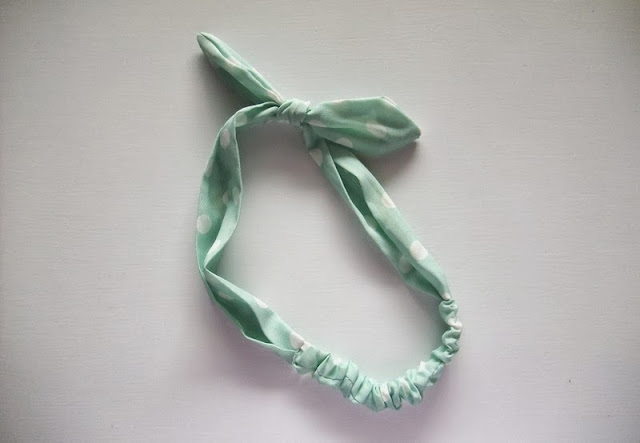 It is made from a nice chiffon material with wires in the ribbon area so you can twist the ends of the ribbon to your liking. I think this is a nice piece to have, especially if you really love the colour mint. 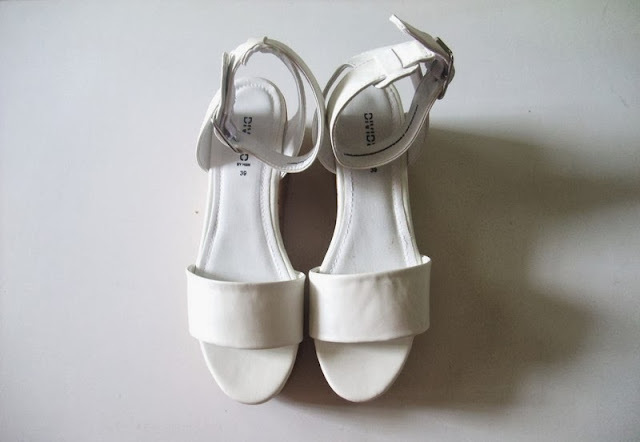 I also got these pair of sweet wedges from H&M shoe section. 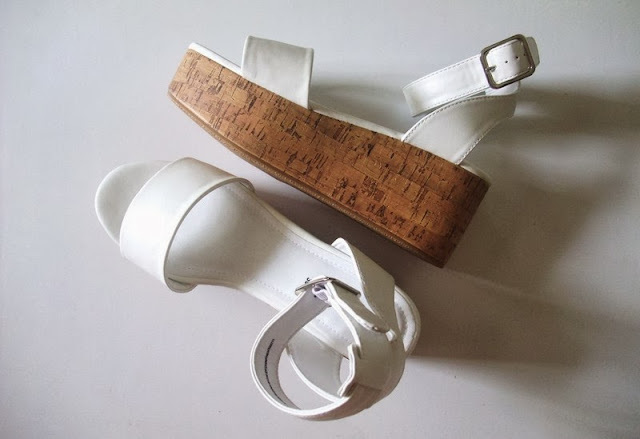 I have been looking for similar designs since forever, sandals are so in trend these days and it was reduced to only S$15 from the original price of S$59.90. They are very easy to walk in too.